INDUSTRY.co.id - Jambi - A total of nine hotspots detected by Meteorology Climatology and Geophysics Agency (BMKG) Sultan Thaha Jambi, update Monday at 05.00 am. Head of Meteorological Station Sultan Thaha Jambi, Nurangesti in Jambi, Monday (9/7/20180, said the hotspot was monitored in four districts in Jambi with confidence level 54 to 86 percent. 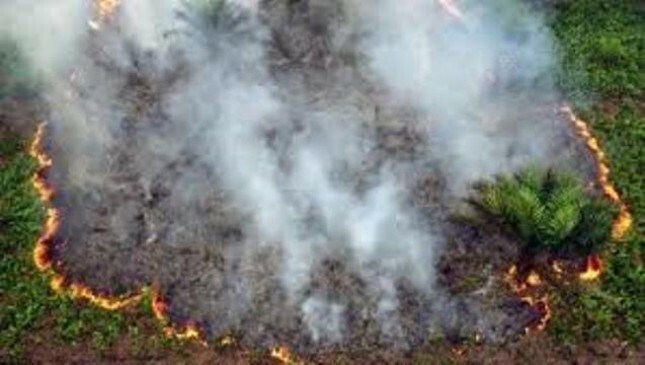 "Hotspot observed in West Tanjungjabung regency for four points, Merangin two points, two points Tebo and Bungo one point," he explained. According to him in West Tanjungjabung hotspot detected precisely in Batang Asam District with a confidence level of fire occurrence 54, 69, 77 and 86 percent. Then in Merangin detected two points, namely in Kecamatan Lembah Masurai with 66 percent confidence level and in District Margo Tabir with level of confidence 85 percent. Furthermore in Tebo detected two points namely in Muara Tabir District with a confidence level of 68-73 percent and in Bungo District one point precisely in Sub-Muko-Muko Batin VII with a confidence level of 59 percent. "For the lowest (54) and highest (53) confidence levels (86) each in Batang Asam District, West Tanjungjabung," he said. Nurangesti said that for Sumatra region, Jambi province was detected the most hotspot update July 9, 2018. Then followed by South Sumatera Province six hotspots, Riau three points, Bengkulu three points and Aceh and West Sumatra each one point.